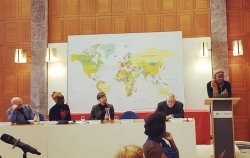 DC CFAR CAB member, Khadijah Adullah, was recently asked by the World Council of Churches and UNAIDS to speak at their conference on Faith and HIV in Geneva, Switzerland. Khadijah is the Founder of both RAHMA and the National Faith & HIV AIDS Awareness Day here in the U.S. Participants in the Geneva meeting included individuals from UNAIDS, PEPFAR, World Council of Churches, WHO, and many other national and global organizations.